How Long Does It Take for Newborn Hamster Pups to Open Their Eyes? Wee hamsters enter the world in rather vulnerable and helpless conditions. Not only are the pups essentially fur-free at birth, they're also totally blind, with their eyes completely shut. Because of these factors, the little ones require a lot of close attention and care courtesy of their watchful mother hamsters. It takes a little while for newborn hamster pups to open their eyes after birth -- usually approximately 14 days, according to SmallAnimalChannel.com. Not only do pups' eyes generally start to open up at this time, their ears also begin to take on an upright positioning, as well. Hamster pups' ears generally remain totally flat onto their heads during the initial couple weeks and days of their lives. Although most hamster pups start to open up their peepers at roughly 14 days, some of them do develop at faster paces than others. Some pups may open up their eyes at as young as between 8 and 12 days old, indicates the California Hamster Association. Once hamster pups' eyes open and they gain their vision, you may observe a marked change in their activity levels. A lot of hamster pups start swiftly racing around their cage settings in curious and investigative attempts to learn about their brand new surroundings. 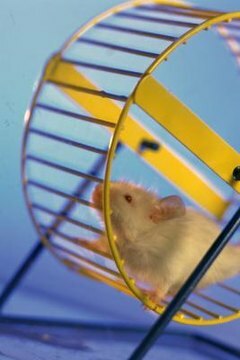 Typical hamster litters usually consist of between six and eight youngsters, notes The Merck Manual for Pet Health. Although the pups are unable to see at birth, they are born fully equipped with front teeth. Pups require nourishment exclusively from their nursing mothers for the first days of their lives. However, pups can usually start taking in gruel-like, soupy and solid meals when they're roughly 10 days old. Avoid touching the litter of pups, and the mother for that matter, for a minimum of a week post-birth. If you interfere with the pups in any way, it can sometimes lead to disastrous results -- think cannibalism from the mother, for example. To ensure that the pups are healthy and thriving, schedule a veterinary appointment for them when they are approximately a month old. The Humane Society of the United States: Is a Hamster the Right Pet for You? When Can Baby Hamsters Start Eating Hamster Food? Do You Have to Wrap Hamsters Cages When They Go to Bed at Night? Do Mice Have Good Eyesight?